San Antonio's AAF franchise hosts the Orlando Apollos, coached by football legend Steve Spurrier, on Sunday afternoon. SAN ANTONIO – Their highly anticipated season opener a success by any measure, the Commanders have moved forward and are well into their preparation for Sunday afternoon's home game against the Orlando Apollos. The Commanders beat the San Diego Fleet 15-6 before an enthusiastic crowd of 27,857 that turned out to watch the Alliance of American Football game last Saturday at the Alamodome. San Antonio faces an Orlando team that rolled to a 40-6 win over the Atlanta Legends on Saturday. The Apollos are coached by Steve Spurrier, one of the legends of the game. The Commanders’ defense had a pretty good outing in the opener itself, finishing with three interceptions and six sacks. Quarterback Logan Woodside led the offense, completing 18 of 36 passes for 255 yards. But Woodside had two passes picked off, one in the Fleet’s end zone. Still, Riley had plenty of good things to say about Woodside. 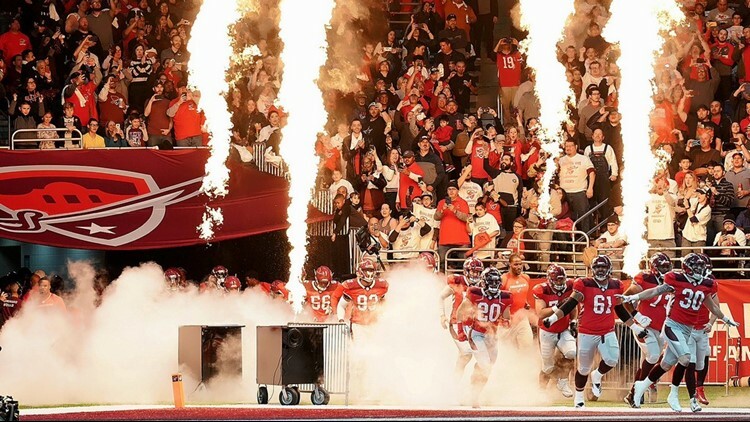 The Commanders received a loud ovation when they took the field to play the San Diego Fleet in their inaugural game last Saturday at the Alamodome. Woodside beat out Dustin Vaughan and Marquise Williams for the starting job and quarterbacked the entire game for the Commanders, but Riley made it clear that the competition at quarterback is still open. “Our basic theme about this is to kind of re-evaluate every week as we go forward, and kind of make a new decision as we go forward to try to be as fair and open with the players as we can,” Riley said. “This is kind of a combination for me of wanting to do everything that we can, the best decisions made to win the game. A Toledo alum, Woodside was selected by the Cincinnati Bengals in the seventh round of the 2018 NFL draft. He signed a contract with the Bengals last May, but was waived by the club on Sept. 1. Woodside was signed to the Tennessee Titans’ practice squad two days later and was released on Sept. 25. The Commanders selected Woodside in the third round of the AAF quarterback draft in November. Like the rest of his teammates, Woodside was ecstatic with the warm reception the Commanders received from San Antonio fans in the opener.